Teach the world how to feed itself, one square foot at a time. “I’m frustrated at times,” says Mel, “I think we’re putting the cart before the horse, but no one can understand that. There are people and organizations spending billions of dollars to save children from diseases, but then they are sending them out into a world that is starving to death. Why don’t we fix that first? Why don’t we teach people how to feed themselves? 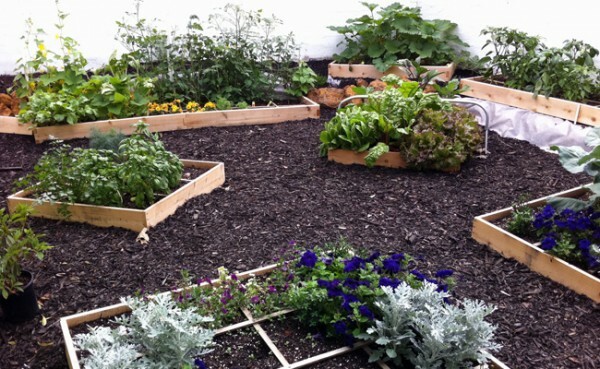 No one and no organization has comprehended yet that this simple method of Square Foot Gardening could be the answer to world hunger.” What will it take? Does that make any sense? Is that a solution ? The frustrating part is everyone talks “feed a man a fish “ but no one wants to “teach a man to fish.” We at the Square Foot Gardening Foundation teach the family how to SFG. When are we going to wake up and really solve hunger? When are we going to wake up and really solve malnutrition ? I am a new and avid fan to your square foot gardening method. My first ever vegetable garden was built over the Memorial Day weekend and I love tending to it and checking it out. It’s so growing so well and it’s so easy! Just as you said it would. I’m posting my experience on YouTube to reach mothers who work full-time out of the house like I do. That’s actually alot of women who think growing their own food takes too much time. I believe our developed country is just as vulnerable to starvation because of the great distances food travels and gardening has essentially been lost. Our dependency on such systems concern me. So that is my effort — reaching the majority of women who think they cannot do this and teach them how they can. If I can, they can. I’m actually sharing your story with my Toastmaster’s group next week. I’m very inspired by your passion for this great gardening concept. I hope to spread the word where I can. I get on my soapbox occasionally also and this soapbox is a great one! Square Foot Gardening would make such sense because it can be done is such a small space, ingredients for compost can be made easily and probably even manure can be found to add to the compost! Thanks Mel for your tireless efforts! I met you many years ago at a library in Sandy, Utah and bought your book and you even autographed it for me. I started SFG then and used it for many years and somehow reverted back to row gardening when I wanted to grow more, yah right. Now I am 100% back to SFG and will never go back. I forgot how easy SFG is, not walking through muddy trenches to pull gigantic weeds. Love this website and the gardeners that post and love your store! I love your letter. All the wonderful things you’ve said, and I just appreciate that so much. Come bring your soap box and put it next to mine and we’ll preach together. You’re right about manure. Manure is more readily available in third world countries than anywhere else because the animals run loose. All the domestic animals run loose and, of course, you know what happens no matter where they are, if they have to poop, they poop. And there it is. Right downtown, on the bridge, or on the street somewhere. What happens when it rains? All that gets washed down to where? The nearest stream, polluting it for the people downstream. If we could get everyone in the world to compost even forget about gardening just get them to compost and pick up that manure. It would certainly end water pollution as we know it today in third world countries. The other would be the washing and the soap that goes into the stream. I’m sure you’ve seen all the pictures in other countries they have to go down into the river or stream in order to do their wash. We’re much more sophisticated in this country, we do our wash in our house and that goes into the sewers, which then goes down to the stream. A little joke there on us, don’t you think? Trisha, you mentioned meeting me many years ago in Sandy, Utah. I remember, I think. I spoke at the library in Sandy. It was one of my first lectures in Utah. It was an odd chance occurrence that I ended up there because I was up in Sunvalley, Idaho, and I spoke at the library there in Ketchem. Had a very nice reception, full house, lots of people. And a couple came up to me after and said, “We’re from Boise Idaho and your practice of Square Foot Gardening fits in with our religion,” which was Mormonism, “so much that we would like you to come to Boise and talk to our church”. Well, I arranged that and I did. They had a big potluck dinner and a big crowd and they had it videotaped and it was a big event. After as I was signing autographs and talking to people in line another couple came up and said, “We’re from Bountiful, Utah and we’re also LDS and we want you to come there if you will and talk to us”. So I made those arrangements and did that a little later. Turned out to be wonderful. They didn’t have a dinner but they had dessert that evening and homemade pies and boy were they good. I remember that talk very well and the assembly hall. Well we’re getting’ near the end of this story because a lady came up after that and said, “I work for the Salt Lake Library System and you would be great in all of our libraries, would you consider doing talks there?” Well I did and now I’m still living in Idaho but I travel down to give these talks and I came down and give and my first talk at a library was where I met you the first time. Isn’t that ironic? I did. Made a presentation. They said, “We’d like to have you put in a display garden here for us. I did. And then I was there in Utah for over 10 years with a display garden and then we got involved with the schools and we ended up as a foundation, non-profit foundation, giving a Square Foot Garden to every school in the state of Utah. That involved a lot of teaching, they wanted me to teach all the teachers how to teach it. And then they asked me to write the textbook for it. So all that has been done and now I’m on a one year sabbatical in La Jolla, California in order to write my next book. Actually I’ve now got a contract to do two books with two different publishers. I’ll tell you about those books in a little while. A little later this summer. I caught the humor when you said you wanted to grow more you went back to row gardening, can you imagine that, that’s almost hilarious. Loved your reference about single row gardening as walking through the muddy trenches, because of course in Utah, watering is quite often done by irrigation where you just flood the whole field and since the the rows are raised. What gets the muddiest? The walking paths. And what loves a lot of waters? weeds. Wonderful combination. Well I’m glad you’re back on board and thank you again for your wonderful letter. Are some of your neighbors now doing Square Foot Gardening there in Sandy? I too feel like more ought to be done about making this accessible in the united states. It costs to start up any kind of garden. materials are the problem. plants can be found for free, wood can be found for free, but for some reason, good compost/composting systems are costly and to make mel mix is even more expensive. SFG is still cheaper than buying soil amendments for a larger, more conventional garden but what can we do about getting more supplies to those who need food security but can’t afford the dirt to plant in? You’ve got some great thoughts there and I’d like to add to them. In fact, let’s build on what you’ve said. I think the secret is in the compost. The amazing thing is that it’s free. Everything you put in a compost pile is what someone else throws away. We just have to collect it. Now, maybe that’s where you come in, and anyone else that really wants to have a good garden using the square foot system. Remember, when we go overseas into third world countries, they cannot afford the peat moss and the vermiculite. So we deal in pure compost, but it’s homemade compost, and we ask that people that really want to solve their hunger problems to start composting. They can gather all the materials that are thrown out around their neighborhood. We encourage the mother to get the kids to go out and start looking for things. Build a compost pile, follow all the steps, and within a couple of weeks you’ll start seeing something happen. It’s also cleans up the neighborhood which is another big huge advantage, and reduces pollution. It’s good for the earth. So why don’t we all compost? Why are we so quick to throw things in the garbage and have someone cart it away to a landfill? That just produces all kinds of undesirable results, including pollution and deterioration of the earth. I agree that Square Foot Gardening is expensive to start with, but it lasts for 10 to 20 years. With a single row garden, you have keep working at it forever, and that’s just as expensive to even get started with all the tools you need and the fact that you have to improve your existing soil. We say forget your existing soil, it’s too hard to improve it, and there’s no need to improve it. If you can reduce your garden size from 100% down to only 20%, that’s the first step, then it’s much easier to get started with a Square Foot Garden. I’ve got an idea Erica, and one thing that we’ve done in the past to people that say, “I can’t afford any part of a Square Foot Garden, or even any garden at all.” Well, we suggested to them, “Go to your local nursery. They’re a small business and they’re open and receptive to new ideas. And if you said to them, “I need compost, and you have a lot of materials here that you throw out. If you’d give me a job, I will work for compost. We’ll keep my hours if you want, and when I build up so many hours I’d be able to receive some free compost from you, enough to start my garden.” And, “Start small,” that’s the other thing we tell them. Start with just the 2×2. As you mention, wood is free, scrap lumber is everywhere in the country, everywhere in the world. Cut it in half each way with a grid and you’ve got four squares to start. Plant one square with 16 radishes, another with 4 lettuces, another 4 Swiss chard, and another with 9 bush beans or 9 spinach. That’s the start of a pretty good salad. As you work at the nursery they’re going to see you’re such a good worker, you’re not only going to get compost you’re going to get a lot of thanks. Now if you have room, you might think about starting to compost on your own property. Again, this is what we do in a third world country. The first step to Square Meter Gardening is to start composting. Collect all the free materials, lean how to compost, build a pile and get it going. Pretty soon you’ll have a finished product. And what do you do with that? The first step is sell it. You can make big money selling your compost. Then you have money to buy food but you take a little compost each time and start your own Square Meter Garden. Just a small one to start. You could put in a little demonstration garden right on their property. They’ve got all the facilities there. And you would agree to do all of that work in exchange for harvesting all the vegetables you’re going to plant. Start small and you’ll be successful. Erica, I want you to think about that. See if we can’t get you going. Pretty soon you’re going to have your own little nursery.